We all know that an ounce of prevention is better than a pound of cure. This is especially true when it comes to your oral health and overall wellbeing. Preventative dentistry is all about keeping your teeth and gums healthy, which means you will have less need for extensive and costly dental procedures down the track. The truth is that brushing and flossing at home are not enough to prevent the development of oral disease as you’re most likely missing those areas below the gum line and in between your teeth. That’s why routine check-ups and cleaning are crucial for your continued good oral health. Treatments involved in preventative dentistry revolve around avoiding tooth loss and periodontal disease caused by tooth decay. Putting preventative measures in place will make your teeth last a lot longer than expecting them to stay in good condition with just routine oral hygiene. Working closely with your dentist will determine what preventative care best suits your situation. Regardless of how many teeth you have, with proper treatments, tooth decay, tooth loss and gum disease are very avoidable. 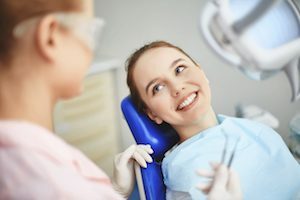 When attending an appointment with your dentist, some treatment might be required at first before a preventative program can be put into place. Your dentist will make sure that your mouth is as healthy as it can be so that it’s easier to prevent tooth decay and gum disease in the long term. Your dentist will show you the right way to brush and clean your teeth thoroughly but gently using dental floss or interdental brushes, and a soft bristled toothbrush. Your dentist will also modify your diet to avoid potential damage to your teeth caused by acidic drinks, foods and unhealthy habits such as smoking. Smoking causes your teeth to become discoloured and could aggravate gum disease. Smoking may mean more frequent visits to your dentist. The best thing to do, if you care enough for your teeth, and your overall health is to give up the habit. Tooth decay and gum disease and their adverse health effects are entirely avoidable with preventative dentistry. You and your family deserve a healthy, beautiful smile and you can achieve this by visiting your trusted team at Cardiff Dental. We have a very modern facility and employ the latest technology available in dentistry ensuring our level of work, and patient care is the best you can get. Schedule an appointment with us today and claim the 6-Monthly Free Dental Check-up for your kids. Contact us on (02) 4954 6888 or book your appointment today! 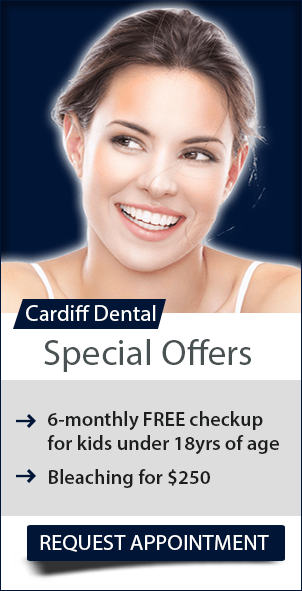 At Cardiff Dental, our goal is to make quality dental care affordable. We encourage you to take advantage of our latest offers. To find out more, visit our special offers page today!